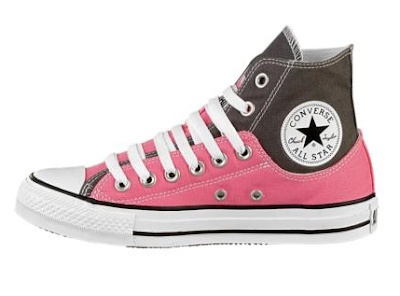 The Converse Blog: New Converse Layer Up Chucks! We've seen many different models of the Converse All Star's, but something we haven't seen until now is a high and low combo shoe. This is more technically known as the Layer up model. I haven't found them anywhere besides Journeys so they could be an exclusive model. 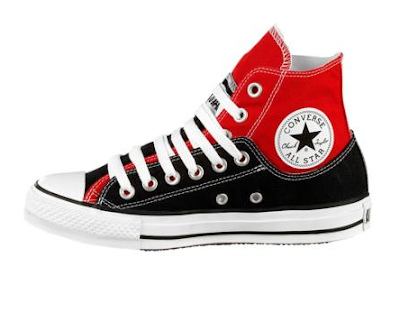 So far they come in Black/Red ( or is that Red/Black?) and Pin/Grey. I've been wondering when this model would come out, I've thought it would be an interesting idea ever since the first pair of double high tops released. If you want a pair then head over here to Journeys, where I got these photos. I've got a new poll coming today so check it out, don't forget to follow us on Twitter! @TheConverseBlog ! There is some at fred Meyer.